On Tuesday 21st, I attended an exclusive preview of "Love, Rosie" at Charlotte St Hotel in London all thanks to Grazia giving their readers a chance to see it before it hit cinemas on the 22nd October. 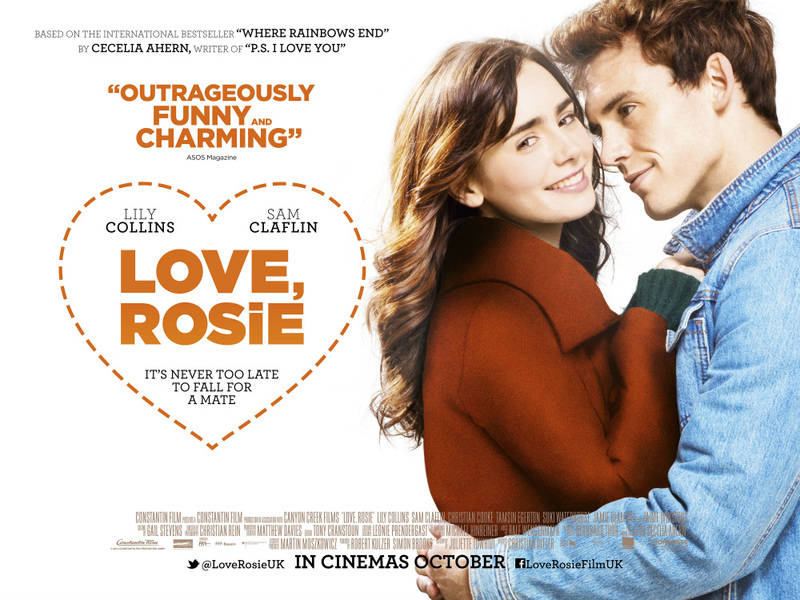 "Love, Rosie" is a beautifully british romcom based on Cecilia Ahern's best selling novel "Where Rainbows End", writer of "Ps. I love you". Basically, life, when it doesn't quite go to plan. Rosie and Alex are the childhood best friends who haven't quite made it as lovers, but should totally have crossed the line of friendship. When the two spontaneously decide they are both going to move to America to study, fate takes Rosie down a complete opposite path. Will time lead the way? Lily Collins who plays Rosie is totally loveable and utterly beautiful, so much so that she actually feels like your best friend. Sam Claflin is hilarious, charming and damn hot, the pair have undeniable chemistry and the whole way through you are routing for them to end up together, however, with the film taking numerous twists and turns it keeps you guessing and that's what I liked, not the inevitable next scene scenario like some romantic comedy films. There's Greg, the fit popular boy, the one that's really a bit of an arse (Christian Cooke), the unexpected best friend (Jaime Winstone) who is just fabulous and kept everyone giggling for the duration of the film, she's out there alright. The annoying one, Bethany (Suki Waterhouse) that girl you hate but actually secretly want to be and finally the love interest of Alex (Tamsin Egerton) who seems perfect in every way... little do we know. You'll laugh, you'll cry (tissues recommended) and you'll become totally fixated and slightly frustrated. "Love, Rosie" is utterly brilliant and I loved it. If you ask me, I think you should go and see it. Even if you leave not liking it, at least the cast are nice to look at. What's your excuse?